Users licensed for the data service can access our India gas supply and power generation data. South Asian LNG imports were 0.39 Mt (20%) higher y/y in December 2018, with all three importing countries (India, Pakistan and Bangladesh) logging y/y growth both in December and 2018 as a whole. We expect regional imports to grow by 25% y/y in 2019 to 35.4 Mt. 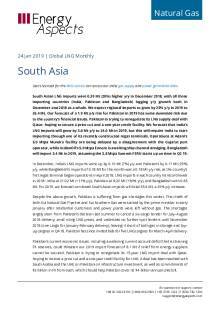 Our forecast of a 1.9 Mt y/y rise for Pakistan in 2019 has some downside risk due to the country’s financial issues. Pakistan is trying to renegotiate its LNG supply deal with Qatar, hoping to secure a price cut and a one-year credit facility. We forecast that India’s LNG imports will grow by 3.0 Mt y/y to 24.0 Mt in 2019, but this will require India to start importing through one of its recently constructed regas terminals. Operations at Adani’s 5.0 Mtpa Mundra facility are being delayed by a disagreement with the Gujarat port operator, while IndianOil’s 5.0 Mtpa Ennore is awaiting ship channel dredging. Bangladesh will import 3.4 Mt in 2019, assuming the 3.8 Mtpa Summit FSRU starts up on time in Q2 19. In December, India’s LNG imports were up by 0.10 Mt (7%) y/y and Pakistan’s by 0.11 Mt (25%) y/y, while Bangladesh’s imports of 0.18 Mt for the month was a 0.18 Mt y/y rise, as the country’s first regas terminal began operations in April 2018. LNG imports in each country hit record levels in 2018: India at 21.02 Mt (+11% y/y), Pakistan at 6.22 Mt (+30% y/y), and Bangladesh with 0.65 Mt. 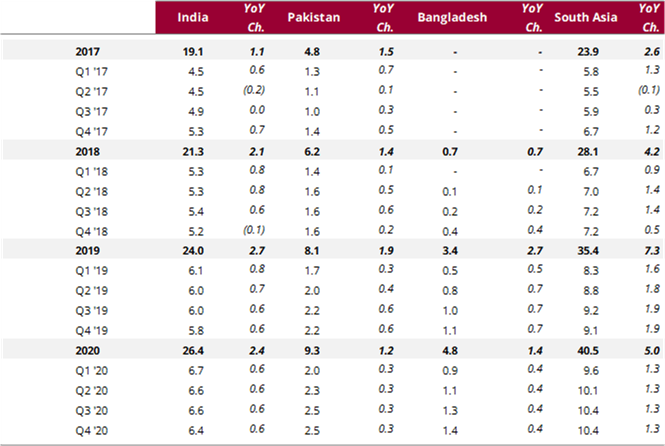 For 2019, we forecast combined South Asian imports will total 35.4 Mt, a 25% y/y increase. Despite the above growth, Pakistan is suffering from gas shortages this winter. The chiefs of both Sui Natural Gas Pipeline and Sui Southern Gas were sacked by the prime minister in early January after residential customers and power plants were left without gas. The shortages largely stem from Pakistan’s decision last summer to cancel a six-cargo tender for July–August 2018 delivery, amid rising LNG prices, and undertake no further spot tenders until November 2018 (one cargo for January-February delivery), leaving it short of both gas in storage and top-up cargoes in Q4 18. Pakistan has since invited bids for five LNG cargoes for March-April delivery. Pakistan’s current economic issues, including a widening current account deficit that is straining FX reserves, could threaten our 2019 import forecast of 8.1 Mt if relief from energy suppliers cannot be secured. Pakistan is trying to renegotiate its 15-year LNG import deal with Qatar, hoping to receive a price cut and a one-year credit facility for LNG. A deal has been reached with Saudi Arabia and the UAE on Pakistani oil infrastructure investment, as well as commitments of $3 billion in FX from each, which should help Pakistan cover its $4 billion annual LNG bill. We project that India’s LNG imports will grow by 15% y/y to 24.0 Mt in 2019. To reach that level, one of the country’s regas terminals originally slated to come online in late 2018 will need to enter service. Adani Group’s 5.0 Mtpa Mundra facility was reported as being completed in October 2018 (as well as 67 km of downstream pipelines) but has yet to receive any gas deliveries. Disputes with the Gujarat Maritime Board have seen IndianOil (IOC) delay its plan to purchase a 50% stake in the project. Amid the uncertainty, Mundra has yet to receive a cargo, despite plans to utilise 1.5 Mtpa of its capacity in 2019. The IOC is behind the next regas terminal to come online in India, the 5.0 Mtpa Ennore facility, the first on the country’s east coast. The final obstacle to bringing Ennore online is dredging the port’s channel, set to be completed in January, after which IOC plans to immediately bring the terminal online. How much of Ennore’s capacity will be serviceable in 2019 remains to be seen due to delays in the construction of downstream pipelines. Currently the facility can only serve local Chennai demand via a 23 km pipeline. Progress on a 600 km pipeline from the terminal south to Nagapattinam has been slowed by environmental groups and construction delays. We expect Bangladesh to take 3.4 Mt of LNG in 2019. Infrastructure remains a pressing issue as the country currently has just one operating terminal, the 3.5 Mtpa Excellence FSRU. A second FSRU, the 3.8 Mtpa Summit FSRU, is currently set to begin operations in March. Summit will initially utilise just 1.0 Mtpa of capacity, until work is completed on a 260 km pipeline between the FSRU’s anchorage at Chattogram and Dhaka. State-owned Petrobangla said that pipe is set for completion early in Q2 19, although that seems optimistic. While further construction delays are possible, a full start-up to Summit in Q2 19 would leave Bangladesh with regas capacity to spare based on our 2019 import forecast. Bangladesh has been scaling back its LNG programme in recent months, with the latest retreat coming in mid-January when it cancelled a 15-year, 1.25 Mtpa supply agreement, which had been awarded to Swiss energy trader AOT Energy in February 2018 but not been signed. This leaves Bangladesh with two long-term supply deals: 2.5 Mtpa with Qatar, priced at 12.64% of three-month average Brent crude plus 0.5 $/mmbtu; and 1.0 Mtpa with Oman at 11.9% of the three-month Brent crude average plus 0.4 $/mmbtu. Despite India’s LNG import growth and a 37 mcm/d uptick in domestic gas output, gas-fired power generation in India was flat y/y at 4.0 TWh in December 2018. Gas-fired output was the only generation source not to log significant y/y gains for full-year 2018—coal was up by 5% y/y (to 986 TWh), hydro generation up by 3% y/y (to 132 TWh) and nuclear up by 2% y/y (to 38 TWh). We think gas generation was flat in December due to hydro-electric growth. Hydro power output rose by 0.8 TWh y/y (11%) in December, even as water reservoirs were lower y/y, at an average of 56% full, down from 58% y/y. In early January, hydro reserves were flat y/y at 50% full, which will likely put further pressure on gas-fired generation early in 2019. Though gas will be squeezed by persistent hydro gains, this will be counterbalanced by a drop in nuclear generation. Output from India’s nuclear reactors was lower y/y in each of the last four months of 2018, with December logging the largest y/y drop at 25% (1.0 TWh). Much of this was due to refuelling and maintenance, which is likely to continue into Q1 19. The Kaiga reactor, which in early December 2018 set the world record for most consecutive days in operation, went offline for inspections and maintenance later in the month and will return to the grid in January. Note: Q1 '17 to Q4 '18 are actuals.